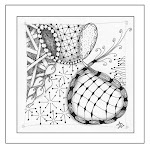 Zentangle - Time To Tangle: February 22 - A New Necklace! Beautifully done, what a stunning art work! So very beautiful! I love it and would wear one....which is saying something because I do not usually care for it! Very pretty! Love the pearls in between, and the shading which makes it look very curved.